Wes Jackson can teach us many things about the land, soil, and conservation, but what most resonates is this: The ecosphere is self-regulating, and as often as we attempt to understand it, we are not its builders, and our manuals will often be faulty. The only responsible way to learn the nuances of the land is to study the soil and vegetation in their natural state and pass this knowledge on to future generations. 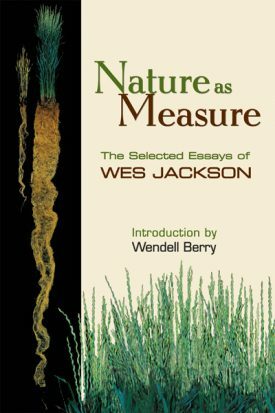 In Nature as Measure, a collection of Jackson’s essays from Altars of Unhewn Stone and Becoming Native to This Place, these ideas of land conservation and education are written from the point of view of a man who has practiced what he’s preached and proven that it is possible to partially restore much of the land that we’ve ravaged. Wes Jackson lays the foundation for a new farming economy, grounded in nature’s principles and located in dying small towns and rural communities. Exploding the tenets of industrial agriculture, Jackson seeks to integrate food production with nature in a way that sustains both. His writing is anchored in his work with The Land Institute, lending scientific and passionate authenticity to topics that—in the hands of other writers—too often fail to escape the realm of the conceptual. WES JACKSON, a respected advocate for sustainable practices, organic agriculture, and environmental scientific understanding, is the founder of The Land Institute. The author of several books, Jackson was awarded a MacArthur Fellowship in 1992, the Right Livelihood Award in 2000, and the Louis Bromfield Award in 2010. He lives in Salina, Kansas.